I am flying a nitro plane with a 850ma 2c lipo receiver battery. There are 4 standard servos and a voltage regulator with a set output of 5.7 volts. 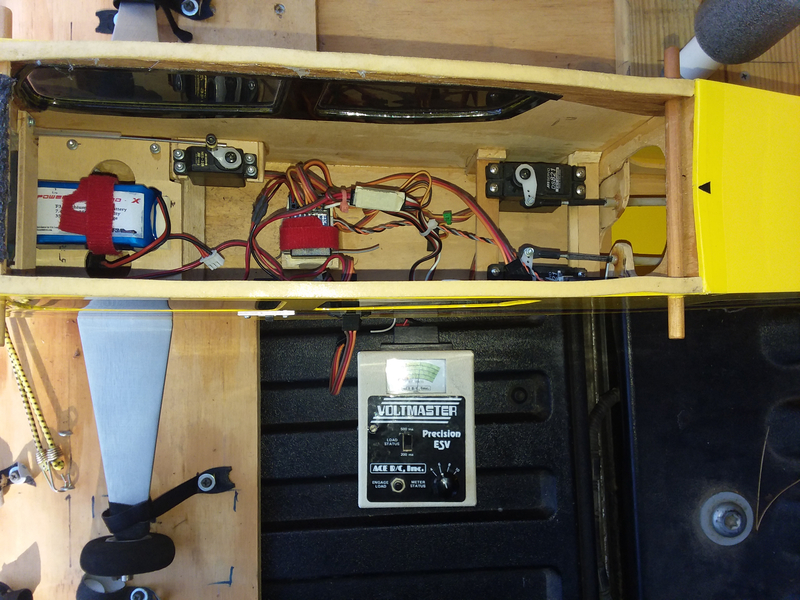 There is also a battery check port on the side of the plane which I can connect to a volt meter (the one shown or a std multimeter). The plane is new to me. When I check the battery after about five 10 min flights the reading is 7.8 volts at the balance plug and the same at the volt meter connection. I also have an old "Voltwatch" monitor attached to the receiver and the fully charged light ( far right one) is lit!. I am assuming that this monitor is for 4 AA cell packs and should show a warning at 4.8 volts. Since I can still recharge the lipo at > or =3.3v /cell or 6.6 volts and the regulator is set to put out 5.7 volts I am wondering at what voltage I should recharge the lipo. You have an 850mAh 2S (two cells in series) battery that will need balance charging with a suitable LiPo charger set to 2S 0.85A (1A close enough) to charge it at 1C rate. No. Each cell needs to be charged to 4.2V (resulting in a total pack voltage of 8.4V) as that is the fully charged level for LiPo cells. 3.5V per cell is only slightly higher than the cells safe discharged voltage of 3.2V. If you have been running your pack(s) to below 3.2V, you are risking damaging them, and if you have run them to below 3.0V, you are damaging them. What charger do you have incidentally? If it does not have specific LiPo capability, you should not use it.